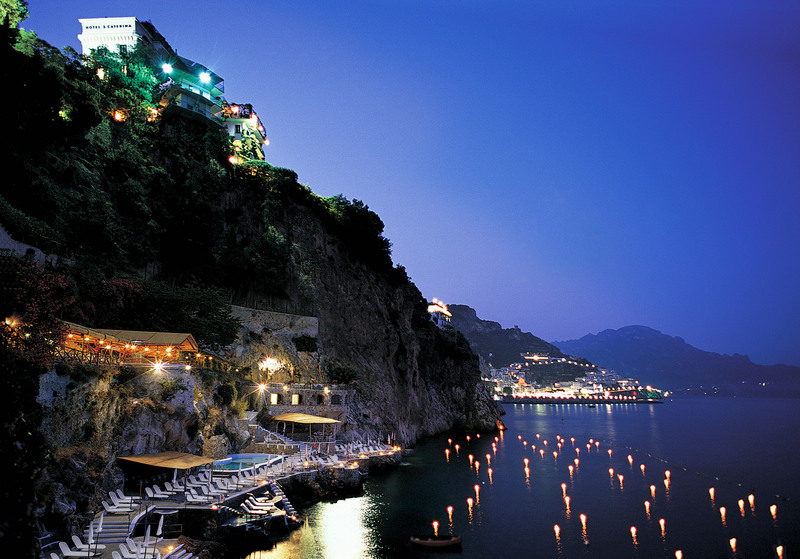 Looking at the vista of sparkling blue water against the backdrop of the Amalfi Coast’s rugged terrain from the balcony of the luxurious Santa Caterina Hotel, we languished over the refreshing local limoncello lemon liqueur. One of the hotel staff approached us saying that the son of the owner of the hotel was getting married the next day and would be having their rehearsal dinner reception at the hotel that night and we were invited. 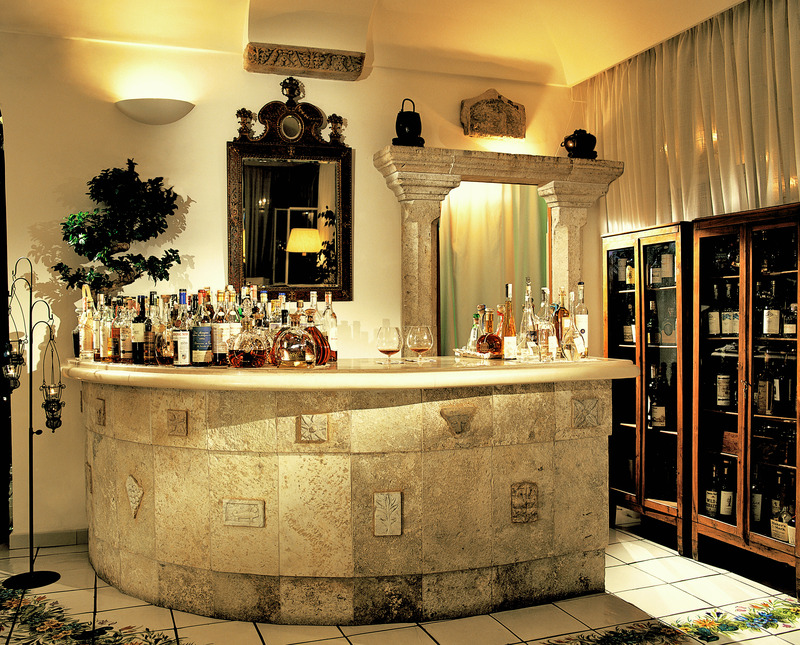 The hospitable parents of the groom, Francesco, own two of Amalfi’s best hotels, including the renowned late 19th century liberty style villa, Santa Caterina. All of the wedding guests were staying at the Hotel; we must have serendipitously booked our hotel reservations before the wedding date was set because everyone else seemed to be part of the wedding party or wedding guests. Having just arrived after spending a few days in gritty, crowded, tasty Naples, we relished the calm serene, comfort, and Italian elegance the Santa Caterina offered. We were excited about the opportunity to have an insider’s experience in an authentic Italian rehearsal dinner reception. As expected, the many small appetizers were creative and sumptuous, some of the best food we have ever had. Drinks were plentiful, served by the friendly, impeccably professional staff. The bride, Sarah, an American, incorporated local lemons and limoncello into the reception décor. Appetizers were served in the lobby which had traditional, colorful Amalfi floor tiles. The buzz of many languages was a result of the multinational guests who hailed from ten countries. After the formal dinner, and numerous toasts to the bride- and groom-to-be, we danced to a variety of types of live music and chatted with the convivial guests. We retired to our beautiful room, thankful for being able to experience such a genuine Italian celebration. The next day the couple exchanged vows in the 9th century Roman Catholic Amalfi Cathedral, which of course, we did not attend. Instead we spent a lovely day wandering the ancient streets of Amalfi. While I generally abhor shopping, I was determined to buy some of the decorative, hand-crafted Amalfi ceramic pottery, specifically colorful plates and address tiles. Meanwhile, when the newly married bride and groom exited the church in the town’s main plaza, they were greeted with cheers from townspeople and tourists alike. That night after their wedding reception, we watched their colorful firework spectacle from our room.